What is the cost of treatment at Canyon Vista Recovery? Canyon Vista Recovery accepts most insurance plans. We are happy to call and verify your insurance benefits for you. If insurance is not available, we offer an affordable cash payment plan to help you get your treatment started. Please see our What Will It Cost page for more details. What is the average length of stay at Canyon Vista Recovery? Addiction research shows that the longer you stay in a supportive, therapeutic environment, the higher your chances are to stay sober long-term. While the length of stay can vary, our programs generally last from 30 – 90 days. What are residents like at Canyon Vista Recovery? Like you, the residents here are rebuilding their lives. They struggle with the same things you struggle with and have had similar experiences. We serve any adult that is 18+, so our age ranges vary. We have a tight-knit community of residents that have gone before you who make up our Alumni. They are active in the sober community and bring services and meetings to our campus. You will most definitely connect with and feel supported by your peers. 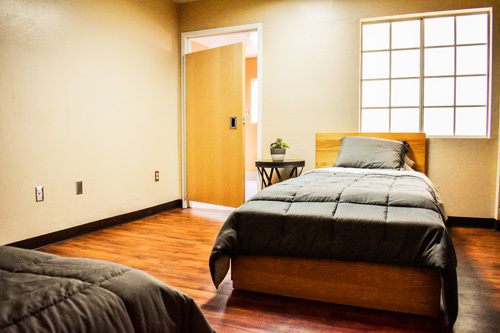 What does a day in treatment look like at Canyon Vista Recovery? Your day will begin with either a morning yoga session or a meditative practice. After this practice, a nutritious tasty breakfast will be provided. Breakfast is followed by therapeutic services. Depending on the day, you will participate in a variety of processing groups designed for our clients that surround specific issues such as trauma, self-esteem, and grief/loss. You will also attend educational groups like nutrition planning, budgeting, relapse prevention, and various life skills. After lunch, you will return for more therapeutic services, which will conclude in the early afternoon. After therapeutic services, we provide various types of physical activity, including going to the gym. Individual counseling is scheduled at various times as well. On some days, you will experience holistic therapies such as the vibro-acoustic lounge or neuro-feedback. Dinner includes a prepared balanced meal. The evening continues with a 12-step meeting and ends with a house-facilitated meeting to reflect on your day. This may seem like a lot, but there are breaks in between all of the activities for you to socialize with your peers or just have some you-time. Please see What To Bring to Canyon Vista Recovery. Other than the initial cost of treatment at Canyon Vista, are there any additional expenses? This answer will depend on any extra items you will need while you are here, such as prescription refills, toiletries, cigarettes, and personal items. We usually recommend having around $30 a week. Can I talk to or see my family while at Canyon Vista? Absolutely. When you first arrive, we ask that you not make any phone calls for the first three days unless they are business-related and pre-approved by staff. This gives you the opportunity to get acclimated here without outside distraction. We want your family to be involved in your treatment in a healthy way. There are designated phone times to speak with your family. Passes are available to see them based upon your progress and engagement at Canyon Vista. We also offer a family healing support group every Wednesday night. Please call us at (888) 979-1840 for more details. Yes, you are able to smoke on campus. We know that getting sober is not an easy process, so we do not expect you to conquer it all at once. In order to respect your peers who do not smoke, there are designated smoking areas. If you choose to quit smoking while you are here, our staff can help provide you support in order to do this. There is a dress code. Please visit our What To Bring page. Can I receive mail, packages, and drop-offs? You can have drop-offs weekly if they are scheduled at least 24 hours in advance and the items are approved by a staff member. Drop-offs are typically done on Saturdays. You have questions – we are here to help.